Munich may be best known for the lederhosen-clad fun of Oktoberfest, but delve a little deeper into the Bavarian capital and you’ll discover a city of genuine substance. Rich history, eye-poppingly impressive architecture and a wealth of museums combine with a youthful vigour to create a destination that’s confident of where it’s been and is equally sure of where it’s heading. Car rental in Munich is the perfect way to make the most of any trip to the city, as well as explore the wider Bavarian region, complete with its fairy tale castles and spectacular Black Forest. Its proximity to the Alps also makes it the ideal starting point for any ski or snow trip. We have pick-up points located across the city, including at Munich Airport and the railway station. We’ll aim to have you in your vehicle and on the road as quickly as possible. When booking with us, you’ll always get our best price guarantee - in the unlikely event you find a lower Hertz price, we'll refund the difference. Munich may not have the bustle or profile of Berlin, but it’s been quietly toasting growing visitor numbers in recent years as word of its charms has spread. The mix of Bavarian beer halls, cafe culture, art galleries and architectural triumphs is an alluring one, while it’s also a prime gateway to the splendour of the Alps and wider Bavarian region. No trip to Munich would be complete without visiting the Marienplatz. The central square of the city showcases an array of Gothic-styled architecture and the tourist magnet that is the Rathaus-Glockenspiel. Part of the New Town Hall, it consists of 43 bells and 32 life-sized figures.that appear on the dot of 11am and 5pm each day (as well as midday in the summer months) to re-enact a pair of 16th-century tales. While you’re in the Marienplatz, be sure to check out the Toy Museum in the Old Town Hall on the east side of the square. If you’re here during the holidays, you can also get into the festive spirit at the Christmas market, or Christkindlmarkt, which has been staged since 1642 and never fails to pull in the crowds. Once a day of exploring is over, park up your rental car and spend an evening relaxing in one of Munich’s beer gardens. A tradition since the early 19th century, there are more than 150 of them to be found in and around the city, including the Chinesischer Turm in the sprawling Englischer Garten – Europe’s largest urban park. While the city boasts a good variety of beers to sample, it’s the mouth-watering food that accounts for much of the appeal. Try whole fish roasted over roaring coals, soft pretzels bigger than both your hands and a seemingly endless array of different sausages. Must-try Bavarian side dishes include Sauerkraut, fried potatoes and rich mustards for dipping. Munich is also renowned for its hearty meat and vegetable stews, while you’ll find the delicious Bavarian classic of pork chops and red cabbage at most restaurants in town. For dessert, savour a crispy and delicious apple strudel, a signature dish of Bavaria. Munich may be packed full of attractions, but the wider Bavarian region serves up countless more famous sights. Just under two hours from the city stands the enchanting Neuschwanstein Castle. Set amid sweeping hills and dense woodland, this 19th-century wonder looks as though it’s been lifted straight from the pages of a fairy tale. Its backstory is a little less chirpy – it was built by King Ludwig II of Bavaria in the wake of the Austro-Prussian War, which effectively stripped him of his powers and saw him retreat into his own fantasy world. He died before it could be completed, at which point it was opened to the public. Explore the incredibly lavish rooms and then head out on one of the hiking trails to enjoy fresh Alpine air and stunning views of the surrounding countryside. Take your hire car even further afield with a road trip via the A8 to the Black Forest. Filled with river valleys, lush forests and breathtaking views, it’s truly a sight to behold. Whatever you want to do, car rental in Munich will unlock the best of the city and the treasures of the wider Bavarian region beyond, allowing you the freedom to explore it all at your own pace. The German road network is one of the most extensive and best maintained in the world, offering easy access to each corner of the country. Marked with the prefix ‘A’, Germany’s Autobahns provide the most direct route from A to B. Speed limits range from 80km/h to 130km/h depending on your proximity to major urban areas and look out for the “dynamic speed limits” where limits rise and fall according to conditions. On the more rural routes, speed restrictions are lifted completely, with only recommended limits displayed. A good rule of thumb for the Autobahn is to keep in the right-hand land and only move across when you’re overtaking. Situated in the south of Germany, Munich is within reach of world-renowned sights like the Black Forest and famous cities such as Nuremburg and Stuttgart. Head southeast on the A8, meanwhile, and the Austrian border is just a 90-minute drive away. Once you cross the border, you’ll find yourself fin Salzburg, the pristine birthplace of Mozart. You can also head west on the A1 and A96 to reach the Swiss Alps. One of the best ways to get out and explore Munich’s surrounding areas is by taking the Romantic Road, or Romantische Strasse, which runs west from the city. Here you’ll find picturesque hills, lush woodland and the fantasy castle of Neuschwanstein. 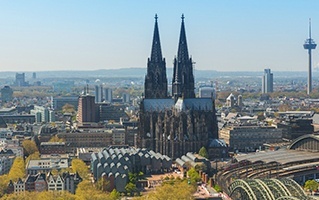 To reach Germany’s heartland and other big cities, head north on the A9 which runs through Nuremburg and Leipzig before reaching Berlin in the northeast. In Germany, you’ll drive on the right side of the road with the speed limit in built-up areas, such as the centre of Munich, usually set at 50km/h. To be on the safe side, be sure to keep an eye on the road signs.